Number 21 Christiana Boateng threads the needle during one of AWC’s 20 regular-season victories, this one against Gateway CC. 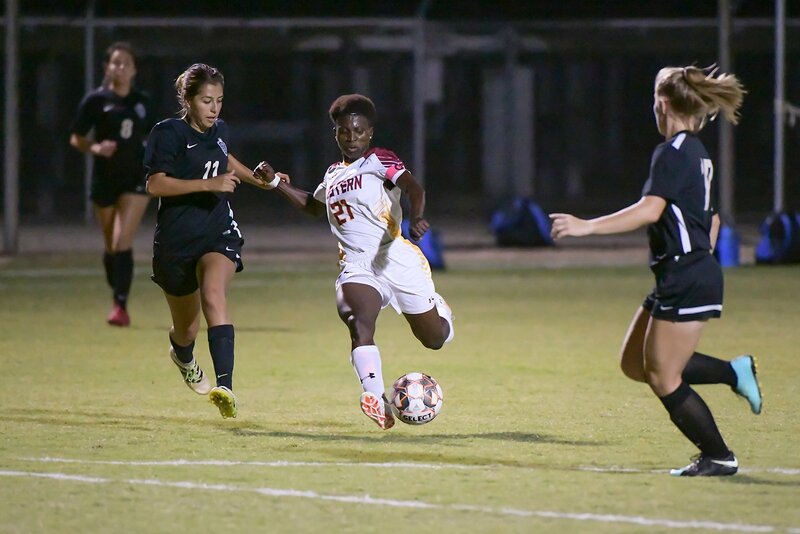 Christiana Boateng played as an unstoppable force all season for the Arizona Western College women’s soccer team. She was named the Arizona Community College Athletic Conference Player of the Year after leading AWC to a record-setting, unbeaten 20-0 regular season. Boateng finished second in the league with 26 goals, and she scored in 15 of the team’s 20 matches despite constant double and triple teams. The sophomore dynamo had 9 multi-goal matches, 8 game-winning goals and 10 assists. Nicole Acosta was named the ACCAC Coach of the Year. She has guided the Lady Mats to their best season in team history with a suffocating defense (11 goals allowed) and Boateng leading the way on offense. “It means the world to me, and I couldn’t have done it without God and the army of people behind me,” said Acosta. Five players earned nominations to the All-ACCAC and All-Region Teams. Boateng, Asare Vera (8 goals, 9 assists) and Karen Melendrez(10 goals, 6 assists) were named to the All-ACCAC/All-Region I First Teams. Goalkeeper Cyan Scott (0.54 goals against average, 48 saves) was named to the ACCAC/All-Region Second Team. Cato Hom (9 goals, 2 assists) was an All-ACCAC/All-Region Honorable Mention. Going into the Region I Playoffs, AWC Women’s soccer held the top seed. How do you feel about AWC's new Endangered Species mural? Western Voice, published by students in the Media Arts program at Arizona Western College in Yuma, Arizona, is sponsored by the Division of Humanities.